My first Kitely cottage Atlantis Beach has been up for sale on the Kitely Marketplace for some time now and so I thought it would be a good time to give an update on my experiences so far. I chose Atlantis Beach as it is my best selling SL Cottage, here’s the link to the SL Marketplace version. The cottage pictured in this blog post is a new version I was working on for Kitely called Atlantis Lava Beach. This is essentially the same as the original cottage but with a darker, broodier colour way coupled with steel framed windows and doors. It has been inspired by the black volcanic beaches of the popular island of Tenerife in Spain. I may create the same version for SL if there is enough interest so let me know! Sales in Kitely however have been very low/disappointing so my Kitely journey is on hold for now. One because I am seriously busy with RL creative pursuits and two, there is no point in throwing energy and good money after something that’s sadly not really going anywhere and three, I need to get back to creating in SL where I do have a market and many loyal customers. As well as the sales being slow, views of the cottage on the Kitely Marketplace have been really low too. 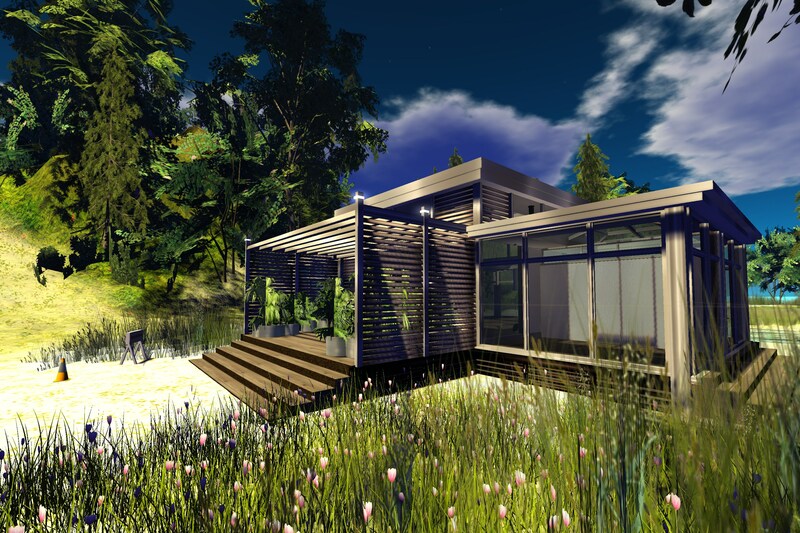 Maybe my style of house is just not popular enough for Kitely but I am glad I gave it a go and will now move onto creating some new houses for SL. The last thing I did want to mention was that I did sell one cottage for US dollars rather than KC dollars and this amount should have been transferred after 45 days to my Paypal Account, it hasn’t been. I tried to look on the Kitely forums etc but found it difficult to find any information that could help. I wrote to Ilan one of the founders who used to respond straightaway – when I was paying more for the services : ) but has yet to come back to me with an explanation. So in the absence of any response and now feeling slightly worried (it’s only a small amount but hey) I have just one question. This is my latest Kitely Avatar. The skin, makeup and lip gloss have had to be created by yours truly although the hair is from Kitely and I even had to modify that to improve the appearance. I suppose that was sort of my point too…they aren’t doing enough to promote it! Previous Previous post: Group Only Gacha Gift Now On! Next Next post: Group Gift For March Released!